We are officially on count down mode for this weekend, aka it’s Expo frenzy-time (technically, I guess we could be lame and call it “Hammer Time”…then we would have a theme song to go along with the mayhem 🙂 )!!! We have been working away at getting primed and ready for the Central Coast Bridal Expo on October 14, 2012. This includes designing catalogs, brochures, contracts, menus, lighting, slide shows, color schemes, flooring, drapery, serving pieces, and of course, furniture! 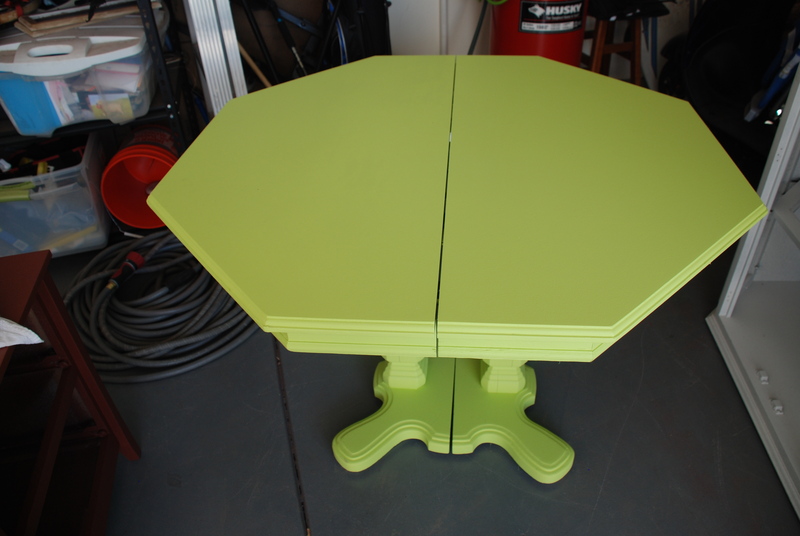 I figure the best sneak peak at all our handiwork would be our Zest table. It will be our signature piece, allowing us room to consult with brides in our booth, and then to use in our future office space as a work and consulting zone (it has a leaf, so we can increase our surface area to allow for paint chips, fabric swatches, centerpiece samples, etc, etc, etc). “But why a signature piece?”, you may ask. Whelp, watch the transformation! 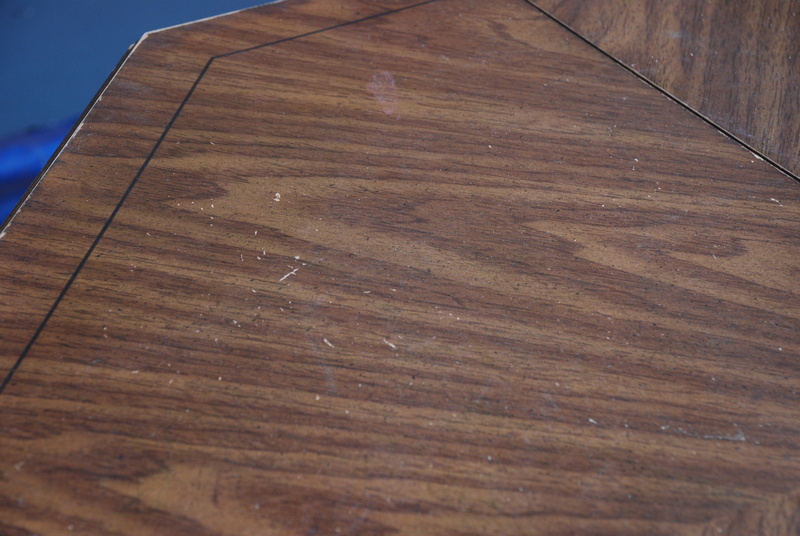 We loved the octagonal shape of this table we snagged on the cheap, but the worn laminate top to this wood table was less than desirable. Actually, the old oak finish was really dated and unattractive. Since the table was predominately wood, and the laminate was just a thin layer on top, we decided to salvage. Ergo, we tackled it with the sander and a good coat of primer. As you can see in the photo, we decided to be geniuses with our time. We had found a sprayer for $27 at a closeout sale and decided to go for it. We majorly patted ourselves on the back just thinking about all the flawless paint jobs that we would blast through with minimal effort. AND, we would be able to use gallons of paint we already had on hand, thereby saving money. The frugal queens were happy! Until we actually started using the dang thing!! Spitter, spatter, sput went our new toy. 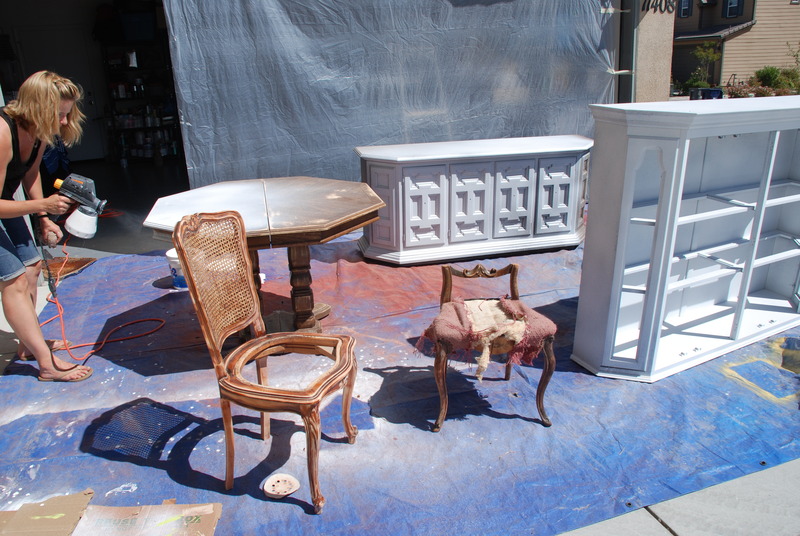 We tried working early in the AM, figuring that the 110* Atascadero heat was clogging things up with dried paint. Well, I am here to tell you that after 3 or 4 days of cleaning, timing, retrying, disassembling, groaning and stamping….we gave up on our frugality and retreated to spray cans for the time being…but not until we had had our way with that STUPID sprayer! Therapeutic, indeed! At least I remembered to unplug the thing half way through our demolition (whoops…thank you Lord we didn’t have to run to the hospital 🙂 ). I guess we weren’t thinking to clearly in our frustration….now back to the table! 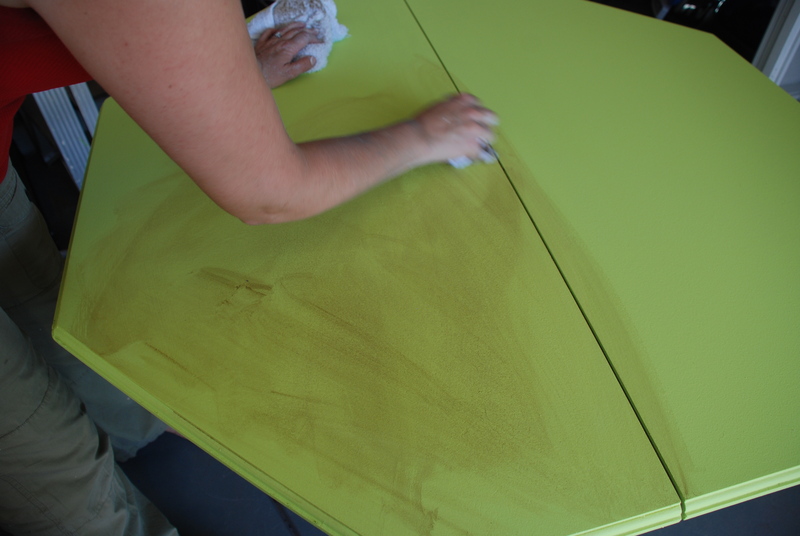 Ok, on behalf of the sprayer, I do have to be thankful that through the sputtering and stopping, it did manage to finish a prime and color coat for our Zest table (we won’t talk about the other 9 or so pieces that we we were working on…don’t wanna go back there, thank you very much 🙂 ). Oh, and now do you get why it’s our signature piece…ah yah, rocking the Zest it Up green, baby! Now time for some character…. 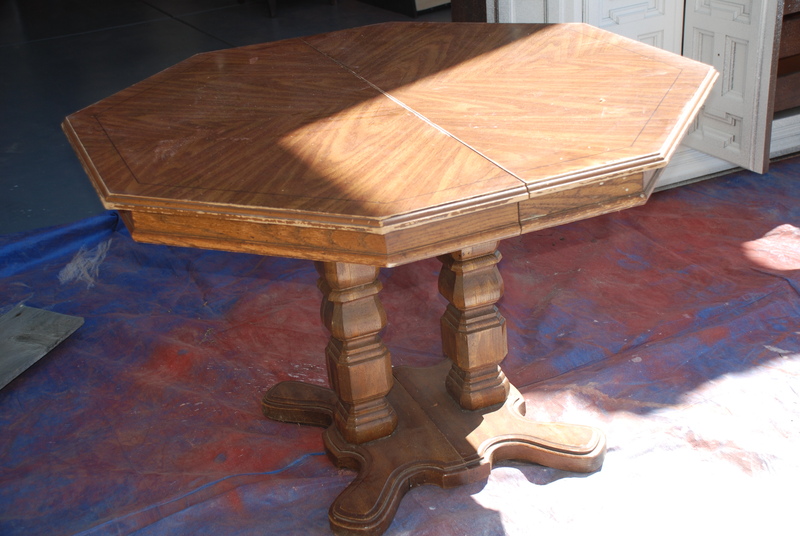 We didn’t want to give this piece a coat of furniture wax because we knew we wanted to coat it with an extra strong clear coat to protect it from high traffic. 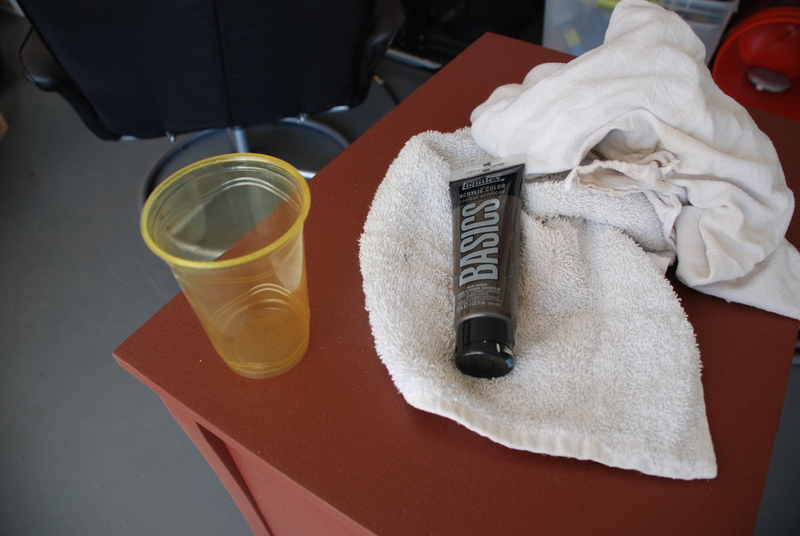 So, to give it the look without the wax, we watered down some brown acrylic paint and applied it with damp rags. This technique works great and you use such a tiny amount of paint. Basically, the water turns your paint into a wash or a glaze. I found that rubbing on an initial coat all over worked well because it allowed the top to dry a bit before I went to apply a second coat. 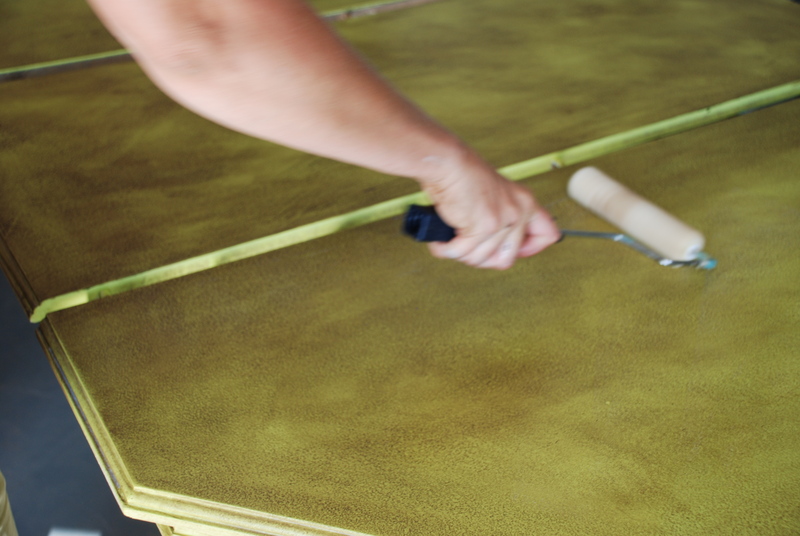 The key to this method is REALLY rubbing and buffing…when you apply the second coat, make sure your rag is damp and it will allow you to essentially push the “dry” coat into all the texture of your base color while giving a wash with the color on your rag. The beauty is that you easily develop depth to the finish. Just rub and blend….remember that the water can make this very forgiving. Once you have the finish you love, let it cure for a couple of hours and then hit it with a couple of clear coats of varnish. 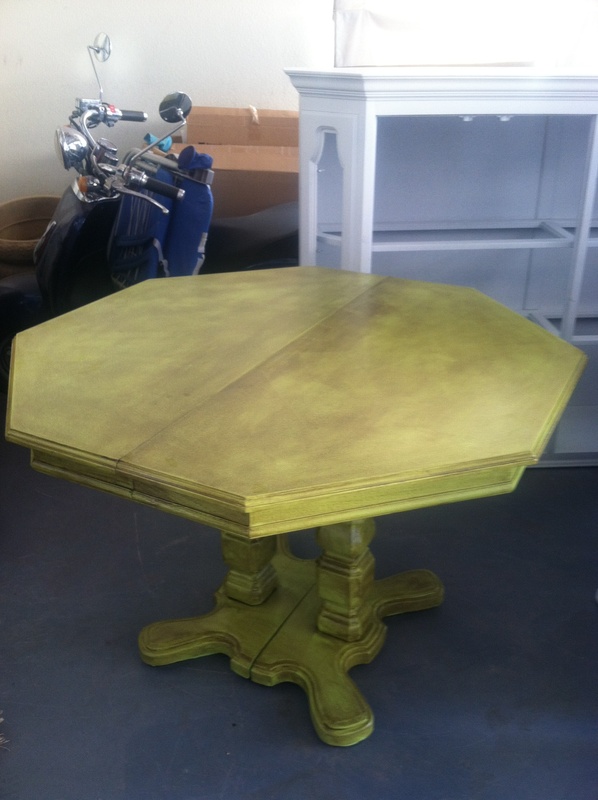 I cannot wait to see this table in our booth at the Expo, accented with silver, candlelight and flowers! If you are in the area, we hope you can swing by and pull up a chair!